Two years ago I decided I'd make my husband a traditional-style sweater to go with his German lederhosen. 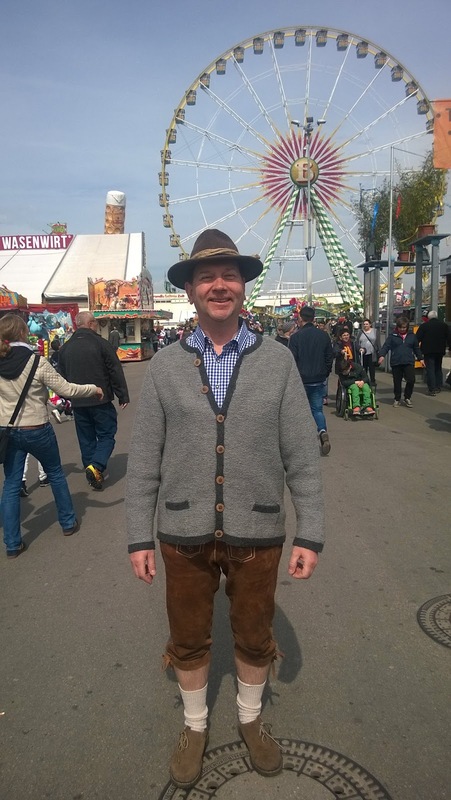 We like to attend the Volksfest (like Oktoberfest) in September/October and the Frühlingsfest in April/May, both held in Stuttgart, Germany. At those times of the year it can be cold and rainy so a sweater would be a welcome addition to his ensemble. At these fests, it's popular to wear the Trachten, or traditional folk costumes of Bavaria (southern Germany) and Austria. 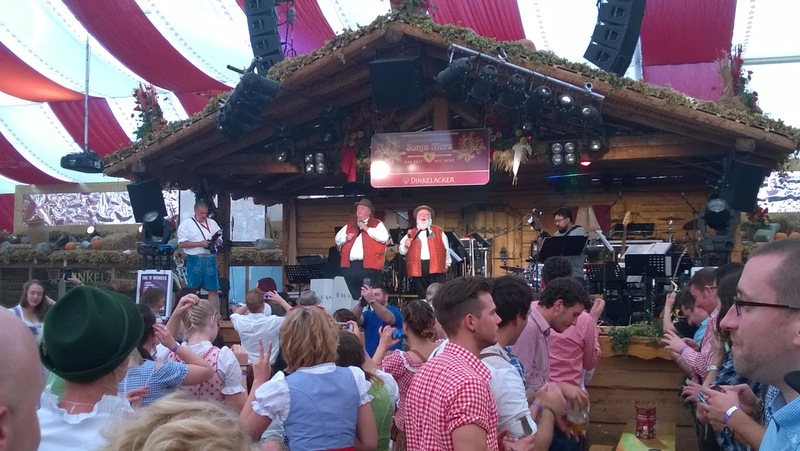 In the tents, it's a real party of beer, food and music and wearing dirndls and lederhosen is almost a must, especially if you don't have an entry ticket. We got in once without a ticket but I think our clothes and age - as in "not likely to cause trouble" - got us in. Proof that I dress up! I did not make my dirndl. I certainly have the patterns, thanks to many September issues of Burda in my stash, but buying one was quicker and easier. So about the sweater. I used a pattern from a (now out of print) German specialty magazine with lots of patterns for knitting Trachten. Of course the instructions are in German. I had some help translating them from my German tutor, except she's blind, so that was an additional challenge. And yes, she knits. To complete the German-ness of the sweater, I decided to use the yarn called for by the pattern - Schoeller + Stahl Fortissima 6fach - which is of course a German yarn. I found it in a local yarn shop, but they only had 5 skeins, enough for the smaller size. I figured this would work because my husband was between the small and larger size, and I didn't really like the oversize-look of the sweater on the model. So I bought the yarn and knit up a swatch...and ran into my first problem: needle size. My gauge on the 2.5 mm needle size called for in the pattern was too small, but 3.0 mm was too big. I needed 2.75 mm, which I did not have, but this is not a size that is easily - if at all - found in Europe. So I had to order them from the US and wait. I started the sweater on the 2.75 mm (US 2) needles and after a few inches I became worried that the sweater would be too large. Somehow my gauge was now a bit big. So I ripped it out and started over with the 2.5 mm needles. I knit the entire back piece but now worried that the sweater was going to be too small! 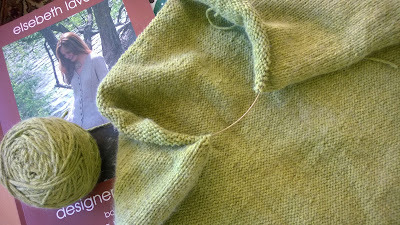 There was some leeway with blocking, as the garter stitch seemed to grow a bit when wet, but when I compared the back to some of my husband's other sweaters, it was clear that the smaller size was too small and I needed to knit the larger size. But I didn't have enough yarn to knit the larger size, and now the yarn was discontinued. I even tried to find some at the yarn manufacturer's outlet store, which lucky for me was only an hour drive away. I left my name and number with the clerk, who thought they might be able to get some but when they eventually called, I understood enough German to know that this was not the case. I was out of luck. I trolled the internet looking for the yarn in on-line stores and found one in Austria but wasn't sure how to order - or pay them. Many on-line stores here use direct payment from a European bank account, which I don't have. They'll also use PayPal but my address in PayPal is a US one and PayPal requires you to create an account in the country that matches your address and for some reason I couldn't set up a German one. Another source for the yarn was Ravelry.com. Sometimes knitters will offer yarn for sale or trade, but I couldn't find any in the color I needed. This husband-sweater was looking like it wasn't going to be finished. My husband, having seen a knitting friend re-knit her husband-sweater multiple times, now assumed that finished husband-sweaters were an urban legend. While I was at the outlet store I bought different yarn to make his sweater, but they didn't have the same color. I bought light blue with dark blue for the trim, but it didn't seem right. I wanted the gray color of the original yarn. 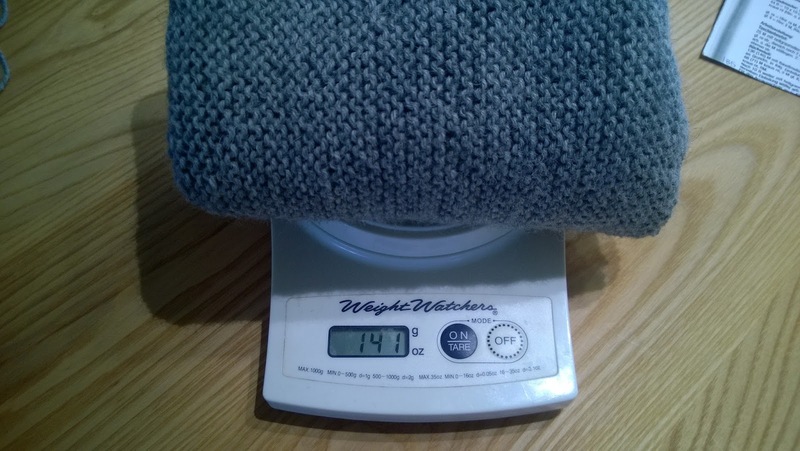 It also didn't help that the yarn called for wasn't the more common "worsted weight" size, but a slightly thinner "DK or sport-weight" size, which is not as common. Finding a replacement yarn wasn't going to be easy either. The spring and fall fests came and went with my husband sweater-less. Then I decided to try again. I got out the larger, 2.75 mm needles and started knitting. I'd just had success with a previous sweater where the gauge was too big, but I knit a smaller size and got the larger sweater I wanted. It can be a risky thing to do - with that sweater I had to rework the sleeve decreases to get the right shape, but miraculously it worked out. On the plus side, the pattern for the husband-sweater had a detailed schematic that showed what the dimensions for each size should be. I figured if I could knit the number of stitches and rows needed for the small size, but get the flat dimensions of the large size, it would work. And it did. I also compared the knitted pieces with his other sweaters as I knit them, making sure that they were in the ballpark for size. But the husband-sweater saga did not end there. As I began knitting the first sleeve, even though I was knitting the small size, the amount of yarn I had left was dwindling at a fast rate. Too fast. I checked and rechecked my project bags and yarn stash. Nope. No mislaid ball of the yarn. It occurred to me that even though I was knitting the small size, I was probably using up more yarn since my gauge was larger. The fear of running out of yarn was growing with each row that I knit. I couldn't wait to get to the end of that sleeve so I could weigh the sleeve and compare it to the yarn I had left. You may remember this post a few months ago where I had the realization that sleeves take up quite a bit of yarn/fabric. Fortunately I found that I had enough yarn to finish the husband-sweater. Except that I forgot about the trim. I didn't use the same yarn for the trim, like the pattern called for. Instead I used a different German yarn: Lana Grossa Meilenweit. 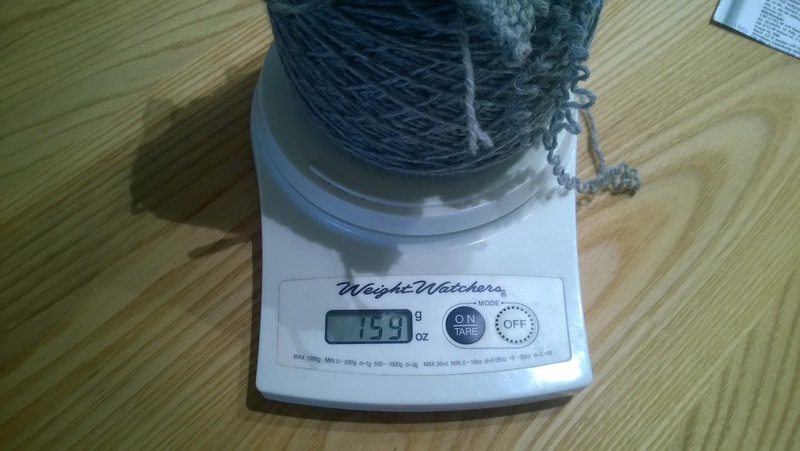 It's a sock-weight yarn but when I knit with two-strands it was close to the original yarn and resulted in a close enough gauge that it worked out just fine. I had two skeins, which I thought would be enough. Well, it was and it wasn't. The last part to knit was the trim that runs along the front and neck edges, and I ran out of yarn on the bind-off row. I was probably short by a yard or two. Again I searched project bags and my stash and I found one doubled over piece, but it wasn't enough. Fortunately the yarn wasn't discontinued but I came up with a different idea - and it didn't involve ripping back one row. I simply bound off using a single strand of the yarn. I barely made it. 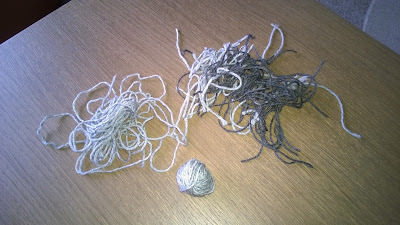 Just scraps of the darker trim yarn and a tiny, tiny ball of the main yarn. I do still have the swatch I knit, so there is a bit more, in case I need to make any repairs to the sweater. I finished seaming the sweater during the 2-hour car ride down to Stuttgart until it was too dark to see and then the next morning, which was the day before the fest. I bought the wood buttons at a Stuttgart fabric store and sewed them on that afternoon. 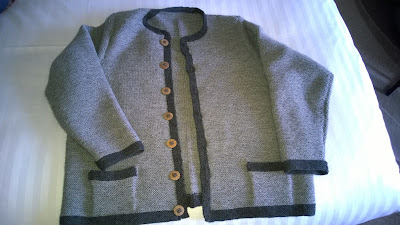 The buttons cost almost as much as the yarn did, but I just couldn't put plastic faux wood buttons on this. You might say this sweater was a labor of love. My husband didn't believe that I would really finish it but I proved him wrong. Needless to say, he loves the sweater. He says it's his new favorite sweater and wore it right away to dinner that night. He wore it to the fest of course, which was perfect for the cooler weather of the morning, but in the tent it was too warm. He kept it on as long as he could and then stashed it in a plastic bag to protect it from beer spills (everyone brings bags for this purpose - you see bags bulging with jackets and sweaters stashed under every table!). Husband-sweater #1 is done. There will be more, but now it's my turn for a sweater. It's another sweater restart - a sweater I started in 2005 but after knitting the back and starting on the front decided that it would be too small. I'm knitting a larger size this time. I hope I don't run out of yarn.